When Julie Behar entered BU, she planned to become a speech pathologist. But a course in American Sign Language (ASL) proved life-changing, opening a door to a community and a culture senior Behar (Sargent) hadn’t known about before. Her passion for ASL and serving the deaf community led her to decide to become an audiologist instead. Historically, the deaf community has had strained relations with audiologists, who have often had a negative perception of ASL and a misinterpretation of deaf people’s lives. As she prepares to graduate, Behar sought the advice of a former teacher: Bruce Bucci, a Wheelock College of Education & Human Development instructor in the Deaf Studies program. Bucci is deaf and a native ASL speaker. In the latest installment of our video series “Office Hours,” Behar asks Bucci how she can become a better ally for the deaf community as she prepares to embark on her new career. For many members of the local deaf community, the Missouri School for the Deaf was as much of a home as their parents’ house. “I cherish that school,” Graduate Rhoda Lee said. Students still spend five days and nights per week, nine months of the year, living, learning and playing among peers and staff who understand them. Alumni now fear a proposal to place a new Callaway County Justice Center at Rice Hall could spell the end of MSD. They shared their concerns during a Friday forum at William Woods University. 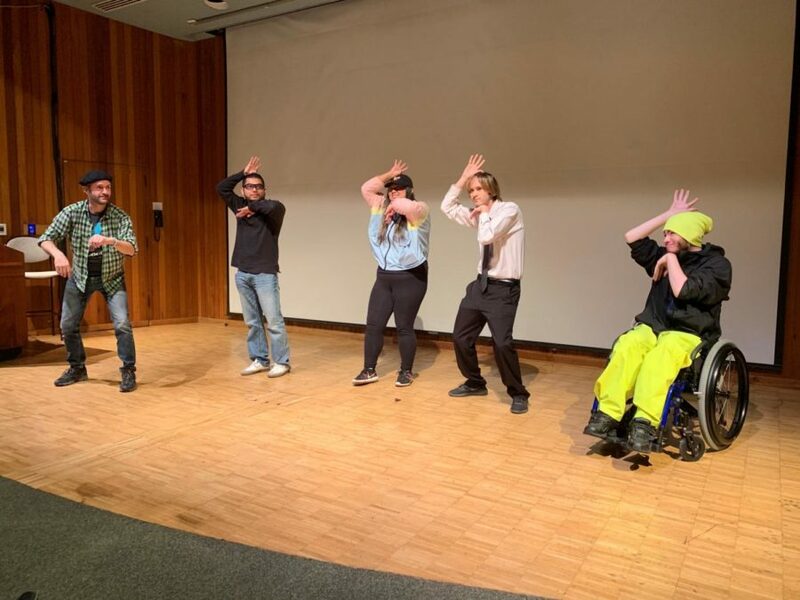 WWU students in the American Sign Language interpretation program helped organize the forum, which was attended by MSD alumni, members of local government and other community members. Alumni quoted in this article spoke through interpreters. “We’re here to support the deaf community as allies, not as representatives,” Brown said. Rice Hall is currently owned by the State of Missouri, but a bill by Missouri Sen. Jeannie Riddle, R-Mokane, proposes selling the building. County commissioners have suggested acquiring the building and renovating it for use as a combined courthouse and jail. Rice Hall is on the corner of campus, but is still only a block away from the elementary school dorms. The deaf community’s reaction was overwhelmingly negative. “I never envisioned something like this happening,” Alumnus Dave Eaker said. The friends he’s talked to about this situation, both hearing and deaf, have been similarly shocked, he said. He pointed out that hearing parents contemplating sending their children to MSD don’t have all the information. They may not understand how valuable a place like MSD can be: a community where everyone speaks your language and understands your challenges. “When they’re making choices, they’re going to rely on what they already know,” Eaker said. When the first thing a parent sees is high fences and a jail on campus, it’s going to make a bad first impression, he said. “We already have a state hospital next to the school and I can tell you parents have reservations about allowing their children to live in that kind of environment,” Ella Eakins, president of the MSD Alumni Association, said in a written statement. Community members have serious safety concerns, as well. “If you’ve got inmates on the loose and police that have to track them down, maybe with weapons drawn. I don’t think that’s a safe situation at the school,” said Monielle Collins, who graduated from MSD in 2005. Alumna Rhoda Lee pointed out that deaf children are vulnerable in ways their hearing peers are not — they can’t hear shouts to get down, or a speeding car or running footsteps. “Even if a security fence is put around both the properties, the jail and the school, it is not fair to ask the MSD students to be treated as if they were the ones in jail,” 1967 graduate Norma Vickers said. She added that during her own school days, Fulton locals sometimes assumed MSD and the adjacent Fulton State Hospital were part of the same campus, increasing the stigma against the deaf students. Adding a jail would compound the issue, she fears. CASTRO VALLEY, California — There’s a sweet and unexpected ending to a story about a little girl who had her hearing aids stolen when her school was burglarized. Seven-year-old Alicia Lyding is deaf and uses hearing aids. While at school, she uses a device called a Phonak, which attaches to her aids and helps her hear her teacher clearly. When her elementary school was burglarized earlier this month, the school-provided Phonak devices were also taken. One week ago, when ABC7 contacted the county’s sheriff’s office for information on the burglary, along with another one at a nearby church, Sgt. Ray Kelly jumped into action, offering to pay Alicia a visit in show of the department’s support for catching the person who took her Phonak. He and his colleagues rolled up to Alicia’s home to surprise her with a ride in a department vehicle, toys and a promise to do everything possible. Alicia was thrilled, especially because her mother, Meghan, says her daughter wants to be a “police girl” when she grows up. While this could have very well been the end of the story, it was far from over. “The news lady came to talk to me!” I love ❤️ this book 📚 you drew for me, Alicia! 😊 This deaf 7-year old had her hearing devices stolen & the guy who admitted to doing it…wrote her an apology letter! Hands spoke louder than words in the Newman Auditorium as a master American Sign Language (ASL) storyteller engaged the audience with poems and advanced signing techniques. National Theatre of the Deaf graduate, Ian Sanborn broke down the steps to his artistic process through animated features that included facial expressions, body movement and rhythm. He shared his passionate through movement to an active, enthusiastic crowd of 40 Santa Rosa Junior College students, several of them deaf or hard of hearing. After the event, Sanborn explained the numerous applications of creative storytelling through ASL documentaries, dramas and educational content. He believes that ASL students can learn to expand on traditional language through creative storytelling. Sanborn has presented at Deaf West Theatre in North Hollywood, Calif., and directed several productions for the Little Theatre of The Deaf, which is part of National Theatre of the Deaf located in the West Hartford, Conn. Sanborn expresses his creative spirit online by demonstrating his theatre work and providing educational videos, primarily for children, who are deaf or hard of hearing. On Monday, Sandborn demonstrated his mastery of theatrical ASL movements and classifiers. His gestures were amplified by his energy and enthusiasm, while also providing ASL words through graceful swaying of his arms. Some of the stories provided required translation, but when he performed his poem “Leaves” no interpreter was required or necessary. The crowd fixated on his every move, unable to look away. Although there was sign-language subtext to the poem, his performance turned into a one-man play that captivated even the non-ASL attendees. In “Leaves,” Sanborn told the story of a rabbit, birds and a developing tree. The unspoken narrative of the poem was the blossoming of this tree in spring, then transitioning through the seasons to lose its leaves to gusts of wind in the fall. Some of Sanborn’s movements were so dramatic the audience was unable to hold back chuckles or full-on laughter. Sanborn’s control of the mood throughout the auditorium was clear. “It was inspiring,” said ASL club president Marc Gonzalez-Martin. He said that Sanborn used ASL descriptions, known as classifiers, in a way that he had not been previously exposed to in class. “I always saw classifiers as these really rigid things that you could use to tell stories, but now I see they’re more flexible,” Gonzalez-Martin said about what he learned from Sanborn. Deaf studies major and ASL tutor Tyler O’Brien, 22, who was also one of four volunteers in Sanborn’s activity, commented about his experience at the event. SRJC ASL student Cecilia Lopez, 20, was amazed by Sanborn’s performance and felt she learned a few things as well. She appreciated the uniqueness of the ASL-style poetry and said it resonated more with her than conventional poetry. “I never really liked poetry — never really understood it — but with [ASL poetry] it’s more like storytelling and something I can actually enjoy,” Lopez said. When asked what he likes most about his craft, Sanborn said it “keeps me young” and “has an impact on the audience.” He truly enjoys entertaining people while providing useful tools for ASL students. “All of that training that I have now becomes beneficial to sign language, to the community and to students,” Sanborn said. Sanborn explained how good it feels for him to express his passion with others. He described his inspiration to create and perform as a deep emotion that originates from within. Sanborn has reached a notable audience through deaf community websites, and he continues to provide creative and educational videos to help deaf children and ASL students. His videos can be accessed on his YouTube channel here, or can be found by searching Ian Sanborn.